If the blockbuster action of giant monsters fighting human-controlled robots didn't do anything for you in Pacific Rim, then you might be a little more interested in director Guillermo del Toro returning to the horror genre with Crimson Peak. Taking the terror back to a period setting, this haunted house tale is one of our 20 Most Anticipated Films of 2015. And now we finally have a first look at the film with a photo featuring star Jessica Chastain. The film looks gothic through and through, and if you saw del Toro's tour of the gallery experience at Comic-Con over the summer, that should come as no surprise. Look below now! 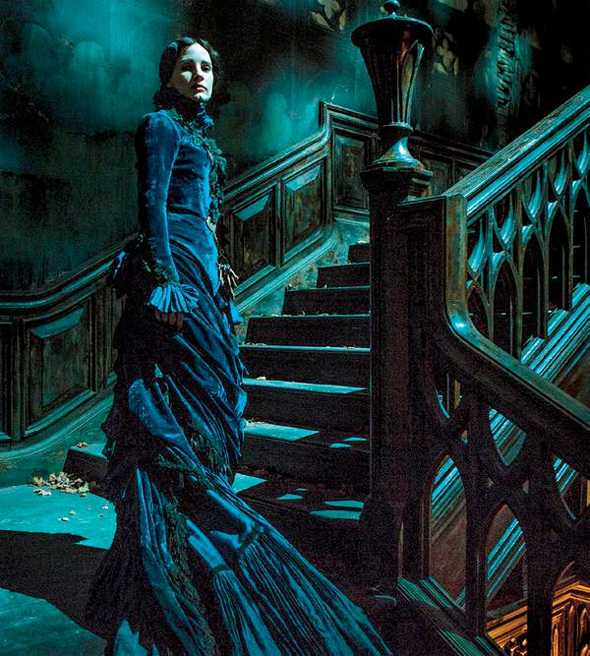 Check out Guillermo del Toro's tour of the Crimson Peak gallery from Comic-Con 2014 right here. Del Toro directed "Pans Labryinth" and "The Devil's Backbone", both masterpieces, so I'm in all the way on this. This really is the greatest cast of actors he's ever had: Mia, Tom and Jessica are fantastic, and we'll get to see how Charlie handles it - I bet he brings it.